Andriy Petrovych Klyuyev (Ukrainian: Андрій Петрович Клюєв), also spelled as Kluev/Klyuev, is a Ukrainian businessman and politician, ranked as 7th "Most influential person in Ukraine" in 2011 by the Korrespondent. He is a former (although for a short time) head of the Presidential Administration of Ukraine. Following being for two years the Secretary of the National Security and Defense Council of Ukraine. His brother Serhiy Klyuyev is also politician and businessman. In 2006 experts estimated the joint assets of the Klyuyev brothers to be US$144 million. In June 2009, Klyuyev brothers were ranked 48th in the Korrespondent 's list of Top 50 richest Ukrainians with the estimated wealth of US$227 million. He was last seen with Viktor Yanukovych in Balaklava, Ukraine in2014. But has since been on Russian television shows. Andriy Klyuyev graduated from the Mining College of the Donetsk Politech Institute as a mining automation and mechanization engineer. He also earned his Candidate of Technical Sciences post-graduate degree in 1989. Klyuyev started working in 1983 as the underground miner of the Zasyadko coal mine, then becoming a foreman at the "Gorki" Mine (since 1984). After the graduation he worked as the deputy chief and the chief of mine transport at the "Bilorichenska" Mine ("Voroshylovhradvuhillya" state holding in Luhansk Oblast). From 1986 to 1991 Klyuyev was conducting full-time postgraduate research at his alma mater. From 1991 to 1994, Andriy Klyuyev headed several coal mining-related machine building companies, including "Ukrpidshipnyk" SC which is widely mentioned as his own company. Klyuyev and his brother Serhiy Klyuyev sold Active Bank in March 2013, as all stakes in solar business were sold in 2008 already. Klyuyev has been repeatedly accused by journalists of being "a shadowy oligarch" with business links to (former President) Viktor Yanukovych's family, allegedly using his power to secure multi-billion contracts. Since 1994 Klyuyev was a deputy chairman of the Donetsk Oblast Executive Council. From November 1995 to April 1996 he was a Deputy Head of the Donetsk Oblast State Administration, responsible for local development, trade, and consumer goods production. After a career in Donetsk Oblast, at the time working closely with later and current President Viktor Yanukovych, Klyuyev moved to national politics. On December 14, 2001 Klyuyev was elected the deputy chairman of the Party of Regions. At the 2002 election, he became a member of the Verkhovna Rada for the Party of Regions, working as head of the Energy, Nuclear Policy and Nuclear Safety Committee. On April 19, 2003 at the 5th Party Congress Klyuyev was elected the secretary of the party's political council. From 2003 to 2004 Klyuyev was the Energy Vice Prime Minister in the First Yanukovych Government. Klyuyev is described in the press as the Yanukovych’s shadow campaign head in 2010 presidential election, following Borys Kolesnikov as head of the electoral headquarter of the Party of Regions. He got named Deputy Vice Prime Minister only, since more influential competitors insight the Party of Regions managed to occupy the posts of the Head of the Presidential administration and the Prime Minister. At the 2006 and 2007 parliamentary elections, Klyuyev was re-elected as a deputy for Party of Regions. On March 11, 2010 Klyuyev was appointed the First Vice-Prime Minister in the Azarov Government, and after the Yanukovych administrative reform on December 9, 2010 he also has accepted the assignment of the Minister of Economic Development and Trade. On February 14, 2012, Klyuyev was appointed Secretary of the National Security and Defense Council of Ukraine. 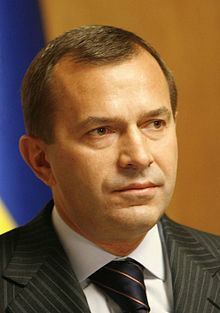 Insiders in the Party of Regions always claimed that his removal from the post of the First Vice Prime Minister, responsible for the European Integration of Ukraine, happened due to the personal conflict with the Head of the Presidential Administration, Sergiy Lyovochkin and was to be seen as a punishment for his influential position within the institutions of the European Union. NSDC secretary sees Azarov as likely candidate for premiership. On 24 January 2014 President Yanukovych signed a decrees that dismissed Klyuyev as National Security and Defense Council secretary and appointed him head of the Presidential Administration of Ukraine. On 23 February 2014, just after the "Maidan revolution", Klyuyev resigned from this post. His spokesman, Artem Petrenko, claimed 2 days later that Klyuyev's had been wounded when his car had been attacked while he was travelling back to Kiev from Crimea after tendering his resignation to former President Yanukovych. Since 7 March 2014 he is wanted for involvement in mass murder. The day before the EU froze his asset.